Va. Beach has much to offer in the way of dinning venues. Tonight–dinner was at Croc’s 19th. St. Bistro–in the heart of “Old Beach“. 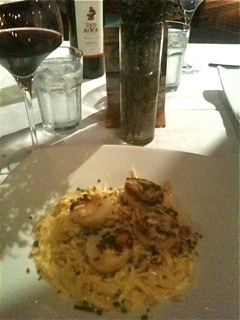 Dinner at Crock’s 19th St Bistro : Located at the corner of 19th. St and Cypress just down the street from the new convention center and 6 blocks west of the boardwalk. Also home to the Old Beach Farmers Market (OBFM). They have a great selection of wine. Tonight we went inexpensive … a Merlot Red Rock 2006 ….. not bad …. and only $6/glass or $20/bottle which is cheap for a bottle of wine while dinning out. On tonight’s menu was Pan-seared Sea Scallops with sun-dried tomato and basil cream sauce topped with pine nuts served over linguine. Just love pine nuts! I chose the half portion, and as you can tell from the photo …. it’s more than enough, especially if you had an appetizer, which we did. House made and baked in an organic French baguette. Was Yummy … went well with the wine! Overall ….. it’s a great neighborhood EcoBistro …. you’ll enjoy it and the prices!